Get your AMD- or Intel-based system the performance needed to stay atop the food chain with ultra-fast HyperX Predator DDR4*. Beat the heat and strike fear into the hearts of your foes with Predator DDR4â€™s aggressive, stylish black heat spreader. Boost your frame rate, keep your streams broadcasting smooth, and plow through your highlight reel editing with speeds up to 4000MHz paired with quick CL12â€“CL19 timings. Itâ€™s available in single module capacities of 8GBâ€“16GB and kits of 2, 4, and 8 with capacities of 8GBâ€“128GB. The Intel XMP-ready profiles are optimized for Intelâ€™s latest chipsets â€“ just select the profile and youâ€™re ready to go. 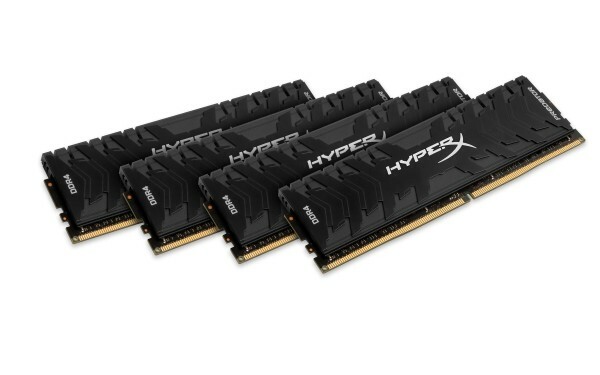 100-percent factory tested at speed, and backed by a lifetime warranty, dependable Predator DDR4 gives you the best of both worlds: extreme performance and maximum peace of mind.